So Autism Daily Newscast told a falsehood. And doubled down. In the screenshot, a lie is highlighted. The lie that neurodiversity proponents don't consider autism a disability. 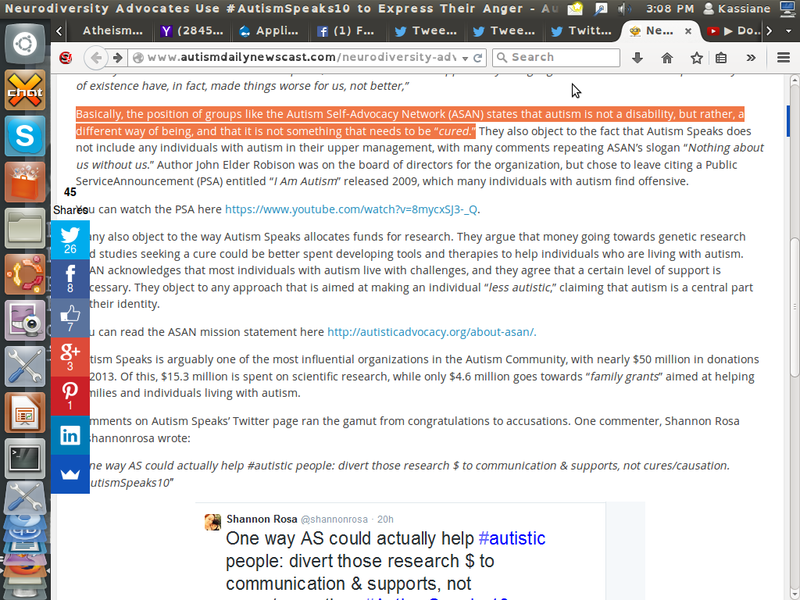 Highlighted is their lie, which says " Basically, the position of groups like the Autism Self-Advocacy Network (ASAN) states that autism is not a disability, but rather, a different way of being, and that it is not something that needs to be “cured.”"
That is not the position of ASAN or any neurodiversity activists I know. So I tweeted them. Twice. And am not the only person who tweeted them. They claimed to not know what I was talking about & requested an email. Ok so this is upsetting. You lied when you said that neurodiversity activists say we aren't disabled. That is a position that has been SOUNDLY rejected, refuted, and is just flat out nope. People who *do* say we believe that, exist. However, they are lying. And they are not neurodiversity activists. It is unprofessional to talk about people without talking to them. Talking to autism parents, particularly the sort who are committing behaviors we protest, is not the same as talking to autistic people (did you not learn that? is talking to me the same as talking to my father? Cuz it's not. Similar experience, in our case, but not the same). Is talking to parents who adopted internationally the same as talking to a transracial adoptee? (no. it is not.) So why do you do it when you talk about us? That is at best unprofessional and at most likely, disingenuous. This is seriously 3rd grade stuff. 1. Talking to parents isn't the same as talking to autistic people, unless they're autistic parents. 2. Trying to get information about what neurodiversity proponents mean by talking to people who reject the neurodiversity paradigm is...there isn't a word for how wrong it is. It's like asking the KKK about racial justice, ok?? 3. When you choose to do these things anyway, you intentionally spread lies. 4. There's no excuse, as twitter is overflowing with neurodiversity people. When will you publish & promote your correction of this willfully ignorant statement that spreads lies & makes it even harder for people like me to get services? Since apparently thinking you're ok, disability & all, means you don;t need help, bc of lies like yours and those of your sources? Seriously. You owe us a correction & a big honking huge apology. Prove my low expectations for you wrong by actually delivering. Shan -please deal with this - I am not even reading it tonight. I do not believe we said any such thing but maybe I missed it. Perhaps she could quote the place we said it? I am so upset that I replied to you rather than Shan Ellis my editor. I am deeply offended by your comments. When you lie, you don't get to be offended about being called out. When you misrepresent a community, you don't get to be offended about being called out. You get to try to fix it. That is your one decent option. You don't really have a right to be offended here, given that *you* lied about *my* community. you said " Basically, the position of groups like the Autism Self-Advocacy Network (ASAN) states that autism is not a disability, but rather, a different way of being, and that it is not something that needs to be “cured.”"
If you don't like being called out on lying, don't do it.You have no right, though, to pull the "so offended" card. You're the one who said to email you what I meant. I did. You're the one who ok'd a lie. This isn't about your feelings, this is about you misrepresenting the facts. Thank you so much for your email. Unfortunately at this time we have no error to correct. I am on the Spectrum myself, and work as a journalist and editor. Our role on Autism Daily Newscast is to report the news without bias, and collect information to present as part of articles for the general reading public. To say that we are lying is indeed a defamatory statement, to repeat this defamation on twitter, or any other social networking site, is in fact under Section 10 of the defamation act a civil actionable offence. I would rather not have to go the extreme of a court case. I hope you feel the same, but we will defend the honour of our articles and writers to the last. We do take a broader view and interview people often and in the case of this article we talked to a collection of neurodiversity activists. We are not here to judge what other people believe, we simply report news. I would like to take a moment and remind you that some autistic people require advocates. The responsibility of advocacy for a child who is non verbal and (I despise this term) low functioning, falls to the next of kin or guardian who is usually the parent. I agree with you to some extent that if the individual can communicate there is no better way of understanding than to talk to the individual, not a third party. Unfortunately for some there is no other means to communicate. I find your comparison with the KKK wholly unacceptable and in incredibly bad taste. We have presented for and against arguments from both sides of the fence and do not feel the need to justify why we have taken this stance as we are completely neutral. "We intentionally spread lies". No my dear, we report news. Again we are completely neutral and present both sides of the story to an audience who enjoy reading us. I completely understand your passion, if you would like to present an intelligently thought through article of your own representing your opinion I'd be happy to review it. I also understand your passion regarding the topic. But there are no mistakes, or errors or palpable "lies" in this article. Thing is: it isn't defamation when you say someone is lying when they're actually lying. It is a lie to say that ASAN's position is that autism isn't a disability. ASAN is anti cure. That does not mean "autism is not a disability". Those are not synonymous. And don't even with the condescension. Just don't. All that indicates to me is "don't even bother, just put it on the blog". Because I actually have more faith in people than they deserve (or that I'll admit to) I sent one more email before starting this blog post. Maybe they just aren't understanding the words that I am saying! When you said neurodiversity proponenets say autism is not a disability, you are LYING. That is inaccurate. Had you fixed it, it would have been an error. As you are doubling down, it's a lie. People fix errors. People double down on lies & try to justify them (do not lecture me on people with differing support needs. That is not relevant. That has nothing whatsoever to do with you spreading falsehoods about what neurodiveristy proponents believe. Many neurodiversity proponents *are* nonspeaking for pete's sake). I see my low expectations are well founded. And they sent me back more condescension, because why not? I see there is very little point in continuing this conversation as you fail to see we are a neutral organisation operating to bring news to the autism community (which I am wholly ensconced in being diagnosed with Aspergers). We truly wish you the best, but at this time this article stands true to the way the reporter has composed it. This person seems to think the "autism community" and the "autistic community" are the same thing, rather than vaguely overlapping sets. She also seems to think that ASAN is "autism self advocacy network". ASAN uses the identity first Autistic pretty much always. And I agree, having this conversation is a waste of time. It has nothing to do with neutrality, it has to do with actual misrepresentations that turned into deliberate lies with the refusal to correct them. So. Here's that pile of correspondence. Currently it is popular in the media to come up with all sorts of reasons my generation (I'm a Millennial) are awful and bad and worthless and all sorts of other unflattering things. It has nothing to do with the economy, nothing to do with the systemic devaluation of labor, no sir. Apparently it's because youth sports leagues shifted to giving everyone a trophy or medal. That is what is wrong with my generation. Fifty sent lumps of plastic, not an economic depression and job market saturation, are responsible for all that plagues my ilk. I have written about my participation in athletics here before: specifically youth basketball, dance as an adult (which has a lot in common with gymnastics as far as how I experienced navigating it while autistic), about benefits of sport in general. It's no secret, I like being active. I feel that everyone should have a chance to be active, and I feel that participation awards are part of that. Something that was happening during my youth: programs were becoming more integrated. More people with disabilities were participating in mainstream sports, particularly kids like me who were 'too typical' in whatever way for Special Olympics but not actually, you know, good. This is a good thing, and it didn't just benefit disabled kids. It also benefitted the able kids who are just not good athletes. Opening the option to everyone is a good thing. I'm going to tell you a secret about kids who got the medals that said "participant" on them: we know we weren't the best that day. Some were not the best any day. A whole lot of us were there anyway because we loved what we were doing, and we wanted to get better. Hell, I knew a 6 year old--this was over a decade ago, she's an adult now--who refused to take her first place trophy because she didn't even meet the requirements of her level, but all her competition fell attempting to do so. To us, the medal was an acknowledgement that we put in effort. You know who got really intense about the trophies? Parents. My mother, at least, had it in her head that if a child is not succeeding at a sport, that child should not do that sport. It doesn't matter if they are enjoying themselves. What matters is that they are bringing home awards; if you can't possibly be the best, she said, why participate at all? It's like "because it's fun" never occurred to her, or many of the adults hanging around. Participation awards convinced my mother that we were 'good enough' to continue in the sports of our choosing. We were succeeding! Look at the trophy! My first year competing tumbling, I was mediocre. Had I not come home from the first meet with a trophy, my mother would have yanked me out. Five months later I got 8th at State & qualified to Nationals. Six weeks after that I got 6th at Nationals. Many years after that I got 3rd at Nationals. But without the participation trophies, which to my parents meant success, I wouldn't have had the chance to get the real benefits from my chosen sport. Things like strength. Things like perseverance. Things like learning to lose and win gracefully. Things like goal setting. Things like learning to cope with a bad day. Building frustration tolerance skills. In my case, building enough physical dexterity to move relatively gracefully through space. Friendships. Knowing how to compete with someone without them being The Enemy. Focus. Comfort in front of an audience. Poise. Working through fear. It wasn't about the trophies, and I suspect it wasn't for most of my generation in the various activities we pursued. I had a lot of trophies. Some were even pretty impressive. The only one I was sad to have to leave when I moved? It was the one that my coaches nominated me for & coaches & judges voted on. It wasn't for being a great athlete (I was pretty good. I wasn't Athlete of the Year material). It was for...sportsmanship, setting a good example for younger competitors, perseverance, grace in both victory and defeat. It was for the things that mattered. But I never would have gotten to that place without participation trophies because of the old idea that sports are only for the most gifted of athletes. Most of the people I did sports with? We did it because we liked it. Not for the trophy or medal. And we knew which trophies and medals really stood for something. Every once in a while someone still ableistly denounces participation trophies with "it's not the Special Olympics". That's bigoted as all get out. Athletes with developmental disabilities are frequently participating out of love for the sport, too (I do have criticisms of SO, namely that it's segregated & run by able people; the way they set up an environment where every participant can succeed is not a thing to be criticized). Special Olympians are athletes, just like anyone who regularly participates in a sport. Their developmental disabilities do not change that, and a gold medal won at a national SO competition matters just as much as one won at any national sporting event. So even if I can't convince you that participation awards are a good thing, at least stop saying this & come up with a real criticism. My generation has inherited a big huge mess. It's not our participation trophies' fault. The world would be even more screwed if we didn't grow up with programs where everyone was rewarded for their success, rather than just winning. We had the chance to learn a lot of things that you can't display on a medal, without which we'd be even more messed up. So stop the hate on for the participation trophies; participating was not and is not a bad thing.